…even if it wasn’t particularly convincing. A well taken goal from Ledley King, a rubbish handball offside one from Peter Crouch (which we shouldÂ try again during the knockoutÂ latter stages of the tournament) and an absolute beauty from Glen Johnson gave England an ultimately flatteringÂ 3-1 win over a Mexican team who had a number of first class chances (23 shots on goal,Â nine on target to our eight attempts, five on target)Â throughout the game. If last night’s opponents play that well in the finals, France, New Zealand and Uruguay will have to watch out. To be brutally honest, there were times when we were outplayed: King’s goal came against the run of play and the Mexican goal just before half time was a result of defending at a set piece that would have embarrassed a team of under elevens. Having said all that…this is exactly what friendlies are for and not playing particularlyÂ well and winning is far, far better than being the best team in the world and losing. I have no doubt that the performance against Japan will better: to put yesterday’s result in perspective, Portugal drew 0-0 with the CapeÂ Verde Islands, which is about the same as England drawing withÂ Gibraltar. Oh and Argentina beat Canada 5-0. I can’t remember if I’ve written it before, but there’s always one team that scrapes in after a rubbish qualification campaign and then suddenly becomes a major threat. Our evil twins may be that team: they’re fourth favourites to win the whole thing at about 7/1. BTW, techology hates me. I was happily twittering away last night and my laptop fan decided it didn’t want to play. Twice. 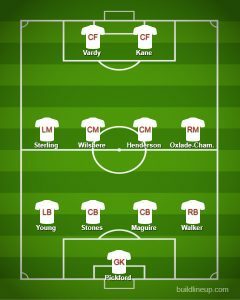 England play their last game at Wembley before leaving for the World Cup Finals against a Mexican side that most of us will next see playing the hostsÂ in the opening game of the tournament. This will be the first time weâ€™ve played â€˜El Triâ€™ since 2001 (a 4-0 win at Pride Park in Derby if my memory isn’t playing tricks on me) and the MexicansÂ donâ€™t have a good record in England: weâ€™ve won all four games played here and they have yet to score. Despite that, we actually have quite a lot in common with them: until about half way through the qualifying campaign they were managed by Sven-Goran Eriksson and in the last four tournaments they have qualified from their group only to be unable to get past the second round. So…umm… actually quite a lot in common then. It used to be quite rare for Mexicans to play abroad (Hugo Sanchez is the only name that springs to mind) but thatâ€™s changed. The provisional squad named by Javier Aguirre contained ten players who play their club football in Europe: captain Rafael Marquez and midfielder Jonathan Dos Santos play for Barcelona, defenders Francisco Rodriguez and Carlos Salcido (five yellow cards and a sending off in qualifying) are team mates at PSV Eindhoven and strikers Guillermo Franco and Carlos Vela play in this country for West Ham and Arsenal respectively.Â However, the most intriguing Mexican prospect for years will probably be playing at Bloomfield Road, Blackpool next season: Javier Hernandez (who will only be 22 on 1st June) joined Manchester United recently and is arguably the best striker to have emerged from the country since Sanchez. Iâ€™ve not seen him play, but if I was Dimitar Berbatov Iâ€™d be on the phone to my agent ifÂ Hernandez starts banging them in during the tournament. Hernandez is more of a long term goalscoring prospect as Mexico donâ€™t really have a dominant striker – the apparently ageless Cuauhtemoc Blanco is 37, neither Franco nor Vela have really done the business at international level and Nery Castillo wasn’t even named in the provisional squad. The short term solution appears to be Alberto Medina, who didnâ€™t play at all in the qualifiers but has scored in two of Mexicoâ€™s last three friendlies including the 1-0 win over Chile last Sunday. Iâ€™ll go for an England win, but if we stop the Mexicans from scoring then I think we can look forward to both the Japan friendly and the first game of the finals against the USA with a lot of confidence. Another point to remember is that the Mexicans are tight defensively and have a decent track record in the World Cup â€“ it would not be a huge surprise if they beat South Africa in the opening game – and so we may have to be patient. And no booing Jamie Carragher either.